The site is programmed for ASP.NET. Its web server is located at Iomart - Supporting The Internet Economy (Scotland, Glasgow.) dns4.nettica.com, ns2.mmbox.co.uk, and ns.mmbox.co.uk are some of its 4 Nameservers. 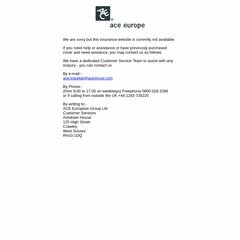 PING acewebserver.co.uk (84.22.185.231) 56(84) bytes of data. A ping speed test response, is timed at 141 ms.